Over the past few years, few U.S. visa categories have increased as much on a percentage basis as the E-2 investor visa. At Visa Franchise, we have advised many clients who invest in U.S. franchises, qualifying for the E-2 investor visa. In this article, we review the E-2 visa, its growing number of issuances, the high growth in Latin America as well as other pertinent topics related to the E-2 visa. 1. Commerce and Navigation Treaty with the U.S.
Investors must prove that a valid commerce and navigation treaty exists between the United States and their country of citizenship, as listed here. Individuals that have dual citizenship with one of these countries may apply for the E-2 visa. Investors must demonstrate that the funds being used to invest in the U.S. business were in possession and control of a national or nationals of one of those treaty countries. This can be a complex issue when a corporate entity is making the investment instead of an individual, and in that case, the nationality of the funds will be the same as the nationality of the majority of the owners of the corporation that made the investment. Investors must demonstrate that they have already invested the money into the business or are very close to doing so. This means that they have already incorporated the U.S. business, signed a lease for premises, purchased equipment, etc. It is important to note that the U.S. government requires that the investment happens before the application for the visa, and this can be scary for many investors. Marginal businesses are those that only make enough money to support the investor and his/her family, but the U.S. government wants to make sure that these businesses intend to grow much more than that. As such, Investors must present detailed 5-year business plans showing how the business will operate, how it will make money, and how it will grow and contribute to the American economy. One of the main benefits of investing in U.S. franchises, such as the ones we work with, is that they have a strong track record of success. As such, consular officers are more likely to recognize them and approve the applications. Additionally, consular officers prefer more "traditional" businesses that have a storefront, inventory, and equipment, instead of "speculative" ones such as consulting firms. While there is no minimum investment amount for the E-2 visa, the regulations require that the investment be substantial in proportion to the total cost of the business. To illustrate this point, consider a new franchise business that has a total start-up cost of $300,000. In this case the individual would have to invest approximately $200,000-225,000 for the investment to be considered substantial. On the other hand, the regulations also suggest that if the total start-up cost is less than $100,000, then the individual should invest 100% of the amount, or very close to it. In our experience, investments less than $100,000 also face a far higher chance of rejection. The Investor must demonstrate that it is an active investment and that he/she is qualified to develop and direct the new U.S. business. While the Investor may certainly hire subordinate professionals, and they are encouraged to do so, they must show that they will have hands-on participation in the day-to-day operations. Unfamiliarity with the language, the new market, and the complex U.S. legal system can hinder an investor's ability to develop their business in the U.S., no matter how good the product is. Another key benefit of investing in a U.S. franchise is that the franchise brand is very engaged in the business and will offer guidance and assistance in the operation of the business to ensure its success. As such, investors can invest with confidence knowing that they can count on experienced franchise professionals to help them in the management, operations and growth. This may not be the case with other types of new businesses. The approval rates for the E-2 visa are much higher than other employment or investor visas like the H1-B or L-1. Over the past few years, the approval rate has stayed steady around 93%. This includes people who did not receive the approval in the first interview and had to return back to the consulate with more information for their petition. 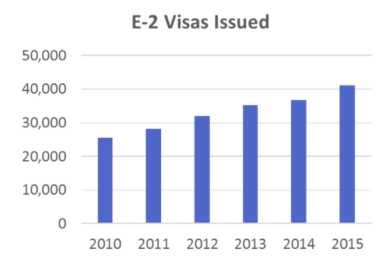 The number of E-2 visa issuances keeps rising! The total number of E-2 visas grew from 25,500 in 2010 to 41,162 in 2015. This represents a 61% increase in E-2 over a 5-year period, more than 10% year over year! The U.S. Department of State provides key figures for E-2 issuances at all the U.S. embassies and consulates throughout the world. 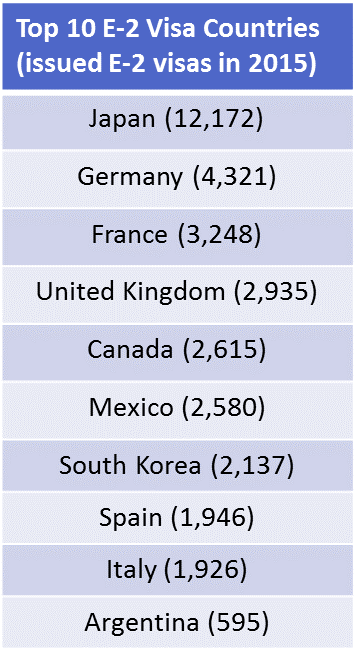 The graph below shows the top 10 E-2 visa countries in the world. In 2015, Japan alone had more E-2 visas issued (12,172) than the entire EB-5 visa program (9,764)! Many of the large established markets have been benefiting from the E-2 visa program for years. For other emerging markets like Argentina (10th in global E-2 visa issuances), it has dramatically increased in popularity over the past few years. Argentina is not alone in the growing number of E-2 visas issued. The entire region of Latin America has been the fastest growing area for E-2 issuances in the world! This might be reflective of the entrepreneur culture in Latin America and recent political and economic instability. In 2010 there were 1,750 E-2 visas issued compared to 4,442 in 2015! This represents an increase of over 150%. The largest market by far is Mexico with 2,580 visas issued in 2015. 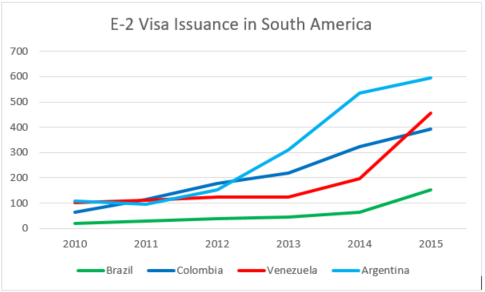 The below chart reflects the largest E-2 visa markets in South America and how they have grown over the past 5 years. Countries like Brazil and Venezuela do not even have an E-2 visa treaty with the U.S.! However, given the large number of Brazilians with Italian, Spanish and Japanese heritage, many qualify for the E-2 visa through their second passport. We see the same with our Venezuelan clients who often times have citizenship from Colombia, Spain, Italy or France. Trump campaigned on immigration reform and he stood up to his words over the first few weeks in office. However, he has not targeted entrepreneurs seeking investors visas like his has illegal immigrants, the H1-B visa and F-1 student visas. In his address to Congress on February 28, 2017, the President called for a "merit-based" system that would admit only those immigrants able to support themselves financially. Certainly, the E-2 visa would be covered under such a policy. There is an executive order that focuses on the possibility of adopting measures to assure that people comply with the terms of the visas that they have. For example, we may see more visits to workplaces for E-2 visa businesses in the future, as is currently done mostly for H-1B visas. For more information read our article on Why Trump Is Good For Immigrant Investors. What types of business qualify? Why is a franchise a safe and secure option? As stated above, the parameters for investing in a business for your E-2 visa are pretty open subject to the business being a real and operating commercial enterprise and that it is not marginal. With franchise investments, the immigration attorney can describe in great detail how the money will be spent and make it very easy for the consular officer to visualize what it takes to start and operate the business. This is different than certain new start-up businesses that may not be able to entirely predict their initial investment needs. The below chart reflects how franchise businesses have a much higher survival rate than independent business. 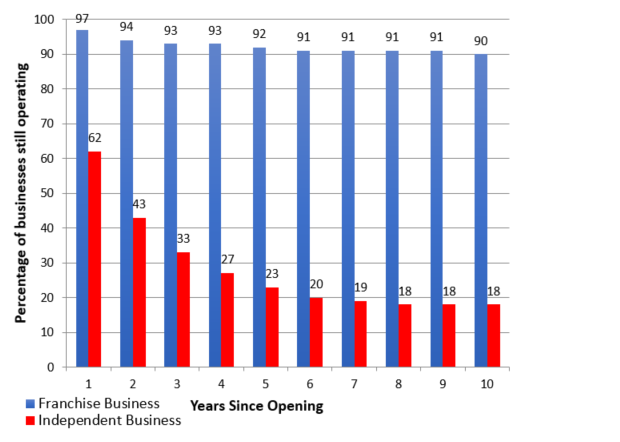 Per a study produced by the U.S. Department of Commerce, 90% of franchise businesses were still open after 10 years compared to only 18% of independent business. Franchisors provide an established model, recognized brand and ongoing support (training, marketing etc.) to ensure your business is a success. Visa Franchise anticipates the E-2 visa category to continue growing and hopes to work with many more immigrant investors in finding and analyzing the best U.S. franchise opportunities. 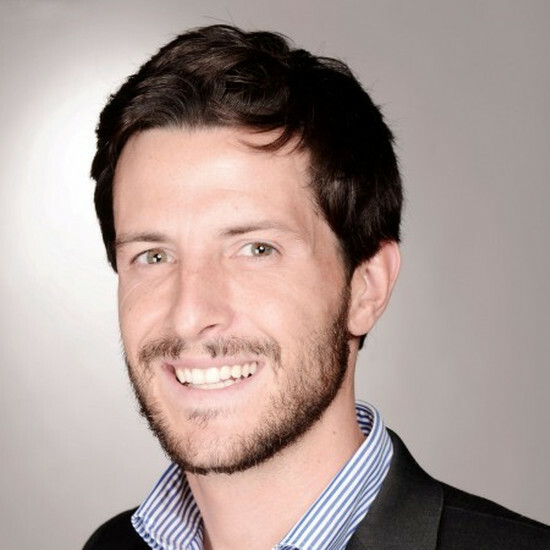 Patrick Findaro is the commercial director of Visa Franchise. He is a business advisor based in Miami, Florida with a focus on U.S. franchise and real estate investments. Patrick’s experience with Franchises, Real Estate, Investor Visas and Latin America brings significant value to foreign nationals seeking investments in the United States. He has the ability to manage an otherwise onerous process of immigrating through investment by partnering with trusted advisors and established franchisors. Moreover, his experience advising multinationals and high-net worth individuals on a wide spectrum of investments provides great market and financial analysis for prospective franchisees. Visa Franchise guides investors in identifying and analyzing the best investment opportunities tailored to their specific objectives. The focus of the firm is on franchises that qualify for the E-2 and EB-5 visas. Visa Franchise is the trusted advisor of clients from all over the world when it comes to helping them find the business opportunity that best meets their investment and immigration goals. Visa Franchise takes into consideration their capability, experience, and size of investment to ensure that they choose the best possible option for their unique, individual situation. Visa Franchise is based in Miami, Florida with a second office in Orlando, Florida. If you are interested in owning a franchise please reach out to info@visafranchise.com or call us at +1-305-454-7744.